By Mike Lofgren – New York Times. Mr. Rubio, like other G.O.P. candidates, rails against the deficit as a sign of President Obama’s moral failure. He advocates a balanced-budget amendment. As a recovering Republican who retired in 2011 after serving on the House and Senate Budget Committees, I have concluded that this ritual denunciation of deficits and out-of-control spending is a fraud. Not only does the party not care about the deficit, but its practice since 1981 has been to worsen it. We should pay particularly close attention to the Republican budget proposals from the presidential candidates in 2016. If a Republican is elected president, the party will almost surely have maintained control of Congress and, therefore, control the federal budget. Since Mr. Rubio offers a detailed plan on taxes and spending — and since he is widely considered an “establishment” candidate — voters might carefully consider what his budget blueprint offers. Here’s the short version: It draws on fantasy math that would wreck America’s fiscal house. On the tax side, Mr. Rubio slashes rates on personal and corporate income, and gives bigger breaks to wealthier Americans. It doesn’t end there. Other candidates would reduce rates on capital gains and dividends, but Mr. Rubio would eliminate those taxes. He almost went out of his way to concoct a policy that would benefit the richest Americans: 79 percent of current revenue from these two taxes comes from the top 1 percent of earners, and less than 10 percent from the bottom 95 percent. He would also end the estate tax. Republicans invariably call this the “death tax,” insinuating that it hits everyone unfortunate enough to die. Not even close: Only about 5,400 estates in America owe federal estate tax for 2015. But getting rid of it would add about $300 billion to the deficit over 10 years. Mr. Rubio’s policies would cause a tidal wave of red ink. A repeal of the capital gains tax would cost roughly $1 trillion over 10 years While there as yet is no estimate for the cost of dividend tax repeal, my best professional guess is a minimum of $250 billion. His entire tax package would increase the deficit by at least $4 trillion. But even Ramesh Ponnuru, a right-leaning columnist who approves of the plan, admits its price tag could be as high as $6 trillion (the plan incorporates highly optimistic economic assumptions). 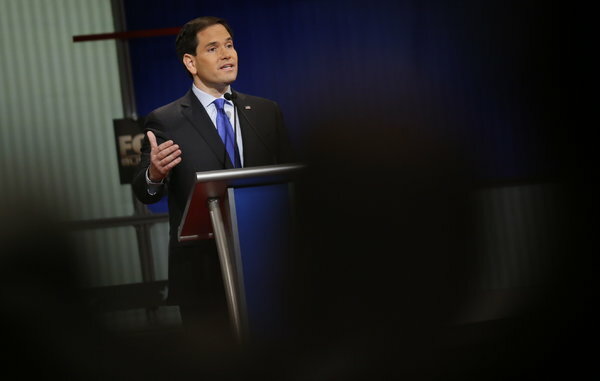 At the same time, Mr. Rubio piles on military spending. According to a Cato Institute analyst, his all-you-can-eat Pentagon budget could cost at least an extra $1 trillion over a decade. Based on my 28-year congressional career analyzing military budgets, I’d say that’s an underestimate. Among the many programs he wants, an additional carrier battle group, extra ground combat personnel (whose pay and benefits will be with us for decades), and missile defense could easily cost more than $1 trillion. For perspective, just one item, nuclear modernization, could alone cost $1 trillion. When I began work on Capitol Hill in 1983, President Ronald Reagan adopted policies devised by his young budget director, David Stockman, who came up with a “magic asterisk” in his documents to show that future deficits could be imagined out of existence by additional unspecified budget reductions. This deception allowed the administration to push through steep tax cuts and vast military increases. Over President Reagan’s two terms, gross federal debt nearly tripled. Republicans have been largely budgeting by magic asterisk ever since. In 1990, when the deficit hit almost 4 percent of gross domestic product and Reagan’s successor, George H.W. Bush, called for a package of spending reductions and tax increases, Newt Gingrich led most Republicans to oppose the measure. He became de facto minority leader. After that, no Republican would dare suggest tax increases, regardless of his promise to balance the budget. By 1998, when the budget was finally balanced, Republicans claimed credit because they controlled Congress. But the real reasons for the budgetary improvement were Mr. Bush’s and Bill Clinton’s deficit reduction packages, which Republicans opposed, and the improved economy of the mid-1990s, refuting the Republican assertion that even the smallest tax increase would ruin the economy. George W. Bush followed the example of Mr. Reagan rather than his father. I was dismayed that he proposed both tax cuts and military increases after taking office while squandering the opportunity to pay down the national debt, an idea that Republicans rhetorically supported during the 1990s. His policies turned a $236 billion budget surplus he inherited in 2000 into a $459 billion deficit in 2008, while in those same eight years doubling the national debt. He left office discredited, but most Republicans have not changed. During my last year in the Senate, in 2010, the Simpson-Bowles deficit reduction commission offered a balanced array of military and domestic cuts along with tax increases. While my boss, Judd Gregg (a rare and vanishing Republican fiscal hawk — he soon retired), voted for it, Republican deficit scolds like Representatives Paul Ryan of Wisconsin and Jeb Hensarling of Texas voted against it, and the plan failed to secure the necessary supermajority. Mr. Rubio’s current fiscal plan is only in the middle range among the 2016 Republican contenders’ budget-busting schemes: Jeb Bush’s would add about $3.7 trillion to the deficit; Donald J. Trump’s, an eye-watering $12 trillion. Yet they all rail against what they call Mr. Obama’s fiscal irresponsibility. Their consistently sorry fiscal record and proposals raise the question: Why hasn’t the public caught on? Republicans have been remarkably successful in delinking taxes from fiscal policy, “framing” taxes as a distasteful personal burden unconnected to widely desired public goods like roads, food-safety inspections or clean water. Instead, they claim that reducing taxes will spur so much investment the cuts will “pay for themselves.” Three decades of evidence have shown this claim to be false, but the candidates display ferocious discipline in pretending that tax cuts don’t harm the budget. The party also benefits from public ignorance of the federal budget. When voters think foreign aid is the largest item in the budget (it is less than 1 percent), or that we can reach fiscal balance by cutting waste, fraud and abuse, they are deluding themselves.